Phase 2 is launching soon and we’re inviting house hunters to come to an exclusive preview evening on the Thursday, 11th of April at 6pm at Cluain Dara Estate, Derrinturn. Phase 1 is all but sold out (just 1 house remains!) and Phase 2 is launching in the coming weeks. There are 19 new, stunning family homes located around beautiful green open spaces typical of Landport developments. Houses available in Phase 2 range from spacious 3 & 4 bed semi-detached to the gorgeous 4 bed detached houses finished to an exceptionally high standard inside and out. Prices start from just €240,000 – outstanding value just 30 miles from Dublin. You can RSVP to attend the event on Facebook – Event Page. Our agents Sherry Fitz and Coonan will be on hand during the evening to answer any questions and exclusive tours of one the new builds will be available. Please note: In order to secure a property, we will require a booking deposit of €5,000, payable by cheque or bank transfer. For further information please register your interest on Cluain Dara website or contact Sherry on 045 868412 / [email protected] or Coonan on 01 628 6128 / [email protected]. 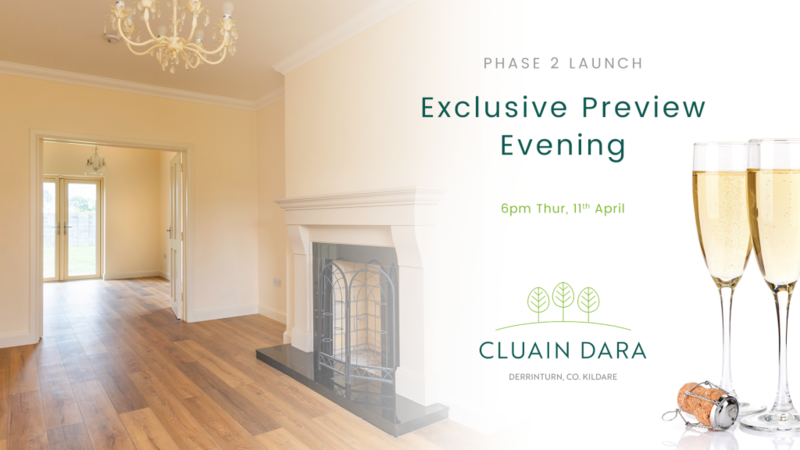 There will be a few nibbles and a glass of wine, beer and non-alcoholic refreshments available – so feel free to come straight after work and enjoy this exclusive preview of the Phase 2 Cluain Dara. Take the Enfield exit off the M4 and travel through the village of Johnstownbridge towards Edenderry. In 8 mins (9km) you will reach a roundabout at Carbury and take the first exit towards Derrinturn. Travel a further 1 min (1.5km) and you will see Cluain Dara on the Right Hand Side.